It’s been written about for ages: customers generally only leave reviews for extremely positive experiences or extremely negative ones. 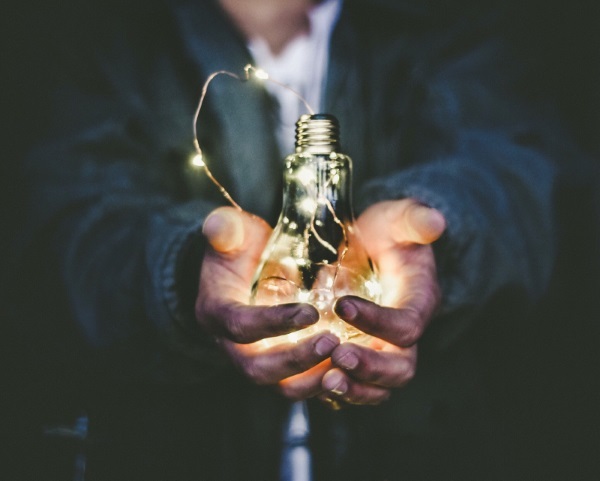 Negative reviews are inevitable, but there are proactive and reactive measures you can take to mitigate and prevent them. The following are strategies I’ve used to successfully convert poor app reviews into great ones. Every company receives bad reviews from time to time. Are you prepared to address them? Once a new review is posted, respond on the same day, ideally within a couple of hours. The user will be morely likely to respond while the issue is still fresh in their mind. It also sets up the conversation to begin positively because a quick response may surprise them, generating goodwill right away. In a sea of indifferent companies, this is a huge competitive advantage. If the review was posted on one of the app stores (such as Google Play or the Apple App Store), you can reply to it inline publicly. This finally became available for Apple developers in early 2017, so be sure to take advantage! Actual BeerSwift Google Play Review: Rating updated to 5 stars! 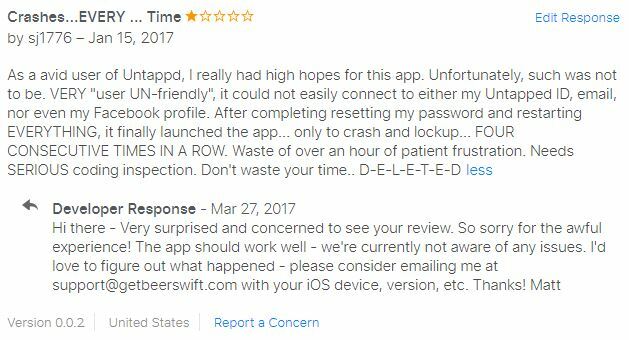 Actual BeerSwift iOS review: Ouch! This review is disheartening because I let the user down but had no way to contact them. The review was written in January 2017, but Apple didn’t release the ability to respond to reviews until March 2017. I still have no idea what went wrong. In my tests, the app functioned perfectly fine on a variety of iOS devices. Unsurprisingly, they never did email me. I responded anyway though, because I believe it signals to future customers that I care. It’s important to remain humble, admit when issues exist, and publicly commit to improvement. It astounds me when brands of all sizes ignore (or appear to ignore) their customers. Frankly, most interactions are low effort and pay off in the long run, as humility and honesty generate tons of good will. Which do you think is better: acknowledging an annoyed user or ignoring them completely? If a legitimate issue is reported, try to fix it as fast as possible. Again, if you focus on quality from the beginning, only minor bugs should slip through. Provide a realistic ETA and reply when the fix is released, even if several weeks have passed. Since no communication has become the norm, over communication is preferable. When a fix is ready, deploy it immediately (Android, Web) or mention that it might take a few days (iOS, due to Apple’s approval process) before they’ll receive the updated app. If you can’t fix the issue in a timely manner, admit it while also offering a refund. Similarly, if a customer asks for a refund, give them one right away. The risk of ignoring the request isn’t worth a negative review. App store refunds involve multiple steps (in my opinion purposely, so as to discourage them), so link to an article that explains the process or detail it in your response. In the case of iOS, having to tell a user that a fix is still a few days out is painful. While I haven’t tried this yet, Microsoft’s CodePush service could help with this scenario. It allows you to distribute small updates to Cordova and React Native-based apps without submitting a new version, thus avoiding the App Store review process. An app issue of mine from last year would have benefited greatly from the service. While attending a conference in San Francisco, I received a handful of Freshdesk support emails mentioning an inability to sign into my app. Sure enough, they were correct: a 3rd party API I was using had corrected a small bug on their end, which happened to introduce a bug in my code. With sign-in capabilities affected, this meant that all new users couldn’t use the app! Yikes. Luckily, I had my laptop and fixed the issue. However, after submitting an update, it took Apple two days to review the new version. There was nothing else I could do except wait for approval. This could have easily been fixed and deployed on the same day with CodePush. Opening the lines of communication between myself and my users is easily the #1 strategy that has turned around bad reviews. Ensure no friction in reaching you: add a “Contact Us” option within the app that opens up the user’s built-in email app. Create an intuitive address such as “support@MyApp.com” that automatically creates a new ticket in your support software. I use Freshdesk’s solution. My favorite feature is custom email forwarding. I have multiple apps, each pointing to a different, custom email address (such as “appOne@company.com” and “appTwo@company.com”). This is beneficial because when someone writes in with a non-specific “Something’s wrong!” email, I know which app they’re using and base my initial response accordingly. This is also useful for analyzing common issues, ticket assignment to support reps, and reporting. My other favorite Freshdesk feature is Canned Responses. These are a huge time saver, especially for small teams with limited resources. You create templated responses that can quickly be added to any support ticket response. As you can imagine, there are many common issues/questions that arise with apps that are perfect for canned responses: questions involving the non-specific (“Help, something’s broken!”), FAQ’s (“How does the app work?”), or app store refunds. Of course, once you understand the underlying issue, provide an authentic, tailored response. Invest some time crafting responses that are helpful; much like robotic automated voice systems, no one likes being treated to cold, sterile canned responses. Like other solutions, Freshdesk also provides the option to set up support forums with FAQ sections. These don’t need to involve much effort; a common approach is to seed the FAQ section with answers from common support ticket issues. Many companies then embed the forum as a WebView in their app (hello hybrid!). Since it’s web-based, the latest information is always available; no app updates are required. Using these solutions may steer users away from leaving a review, since they’re finding an answer outside of the app store ecosystem. However, better to have a satisfied customer and not receive a review, than to risk not helping them and get a bad one! Consider collecting your user’s emails on your website and within your app. Yes, the classic reason is to market and sell more products to them over time, but here’s another idea. Suppose an external service that your app relies upon goes down. You could contact users over email, informing them of the issue and the ETA to resolution. Naturally, this should be saved for special occasions only, as otherwise it’ll be seen as annoying. What a great way to add a personal touch, though! Not those types of notifications. To build on the above idea, inform users of critical issues on app startup. Much like we’ve seen companies display a “New Features” modal pop-up, consider building a “Critical Issues” version. A simple solution would involve the app pinging a server in the background that returns details of any ongoing issues. 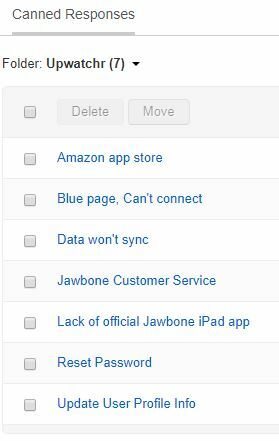 Setting up these systems and strategies I’ve suggested does take time, but enacting these tips is an investment in the long term success of your app and business. Positive word of mouth can’t be bought - it must be earned. Act accordingly!